Little by little I keep getting a little more interested in the holiday season. Not full on excited by any means, but my entire instagram feed is bombarded with holiday cookies…which gets me a tad excited. If you ever want me to like something…involve food. But this feed of constant sprinkled and frosted cookies isn’t exactly helping me out with trying to clean up my act before I leave for Mexico on Friday. I’ve been traveling for the past week and eating out for every meal and having more cocktails than usual, so I just don’t feel like my best self. So this week I’m trying to keep it as clean as possible so I feel good about being in a swimsuit in the dead of winter. Thank God for spray tans. But for real, I’m going to be in Mexico TWICE this month. It just worked out that way and I’m definitely not complaining. My best friend turns 30 and decided she wanted to go to Tulum for her dirty thirty. Duh. Done. I’m there. So we leave for Tulum on Friday, which I’m pretty pumped about because I’ve never been to Tulum. I’ve been to Mexico I think 6 times and this is a completely new place. I’ve only heard great things but I also haven’t done any research since I haven’t sat still in months. So if you have any recommendations, let me hear them! I’m kind of bummed I didn’t plan ahead because I would have totally purchased this one piece swimsuit and this one too. But I luckily got my hands on this bikini and this one too, so I have some fun new suits to sport next week! Balls, I need to pack. Even though I’m kicking off my holidays on the beach in the sand, I’m still feeling the traditional holiday recipes back here at home. 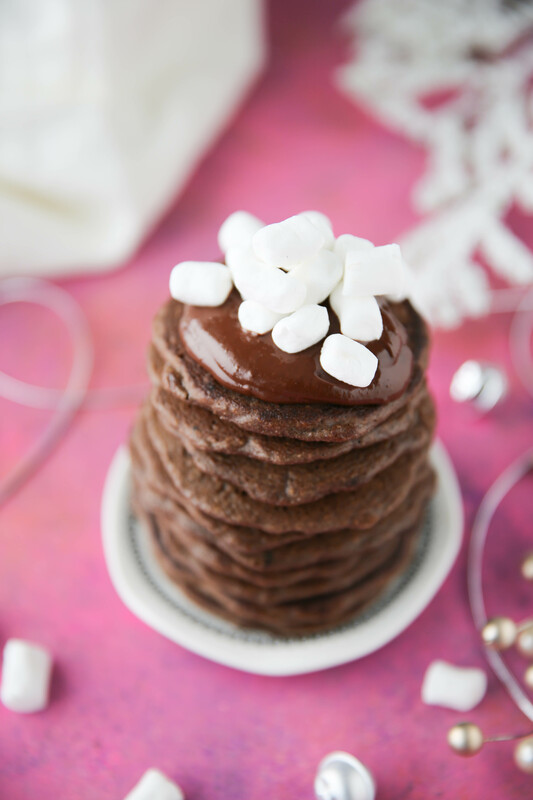 Well, are hot chocolate pancakes traditional?? Who knows and who cares, really?! I would eat these any time throughout the year. 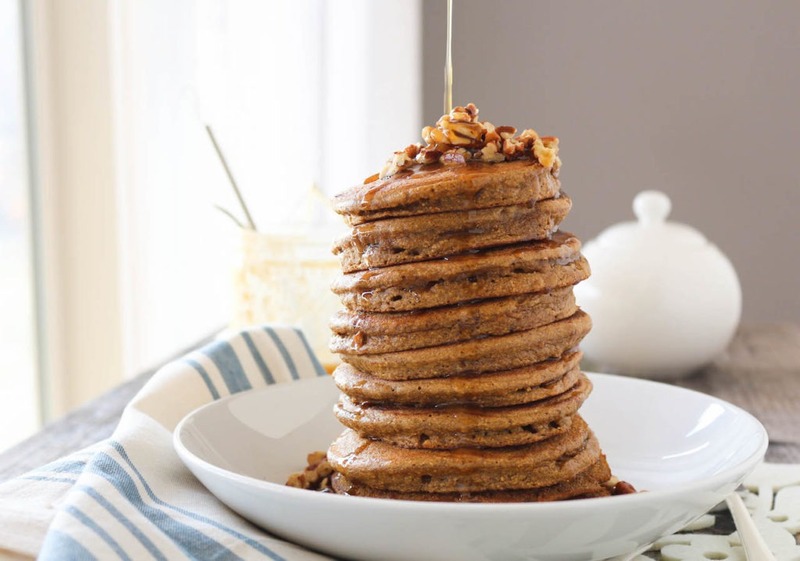 These pancakes were made with Nuts.com Paleo Baking Mix to make the baking process easier than ever. I’ve used this mix in my Sloppy Joe Meatball Cornbread Sliders, my Basil Tangerine Pound Cake and just recently used the mix for my Cornbread Turkey Pot Pies. This mix from Nuts.com makes paleo baking SO much easier and way more convenient. Instead of having to purchase almond flour, arrowroot starch, coconut flour, and tapioca flour, they put it all together in a 1 pound bag and it can be used as a 1:1 replacement for conventional wheat flour. It’s seriously awesome! And when you’re grabbing a bag of this Paleo Baking Mix, you can also shop a ton of organic dried fruits and nuts, delicious chocolates, and a ton of snack ideas. They have so many cool products on Nuts.com but I think this Paleo Baking Mix is my absolute favorite! In a large bowl, whisk together the flour, cocoa powders, baking soda, and salt. In another bowl, whisk together the eggs, almond milk, maple syrup and vanilla extract. Pour wet mixture into the dry and mix until completely combined and smooth. Place a griddle or sauté pan over medium heat and grease. Once hot, use a cookie or ice cream scoop to pour 2-3 inch pancakes onto the griddle. Once the pancake begins to bubble, you'll know it's time to flip. Cook for about 3-4 minutes per side until cooked through. Repeat until no batter remains. This should make 14-15 three inch pancakes. 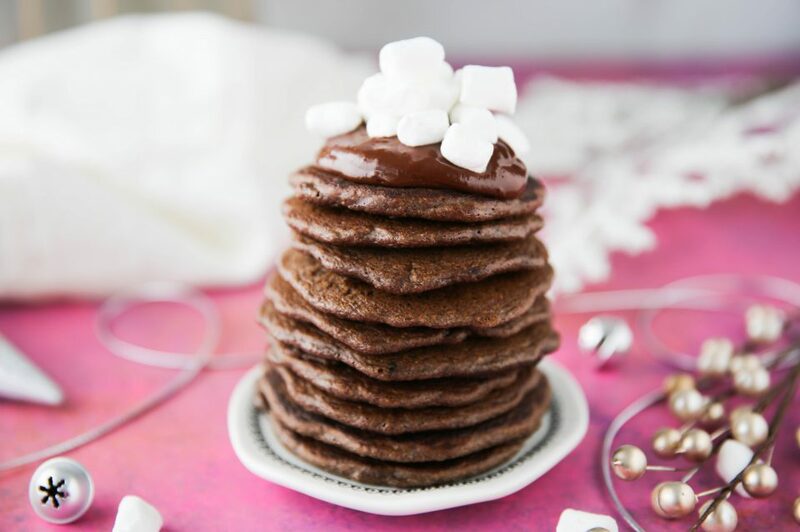 Once pancakes are done cooking, melt chocolate and coconut oil in microwave or double boiler. 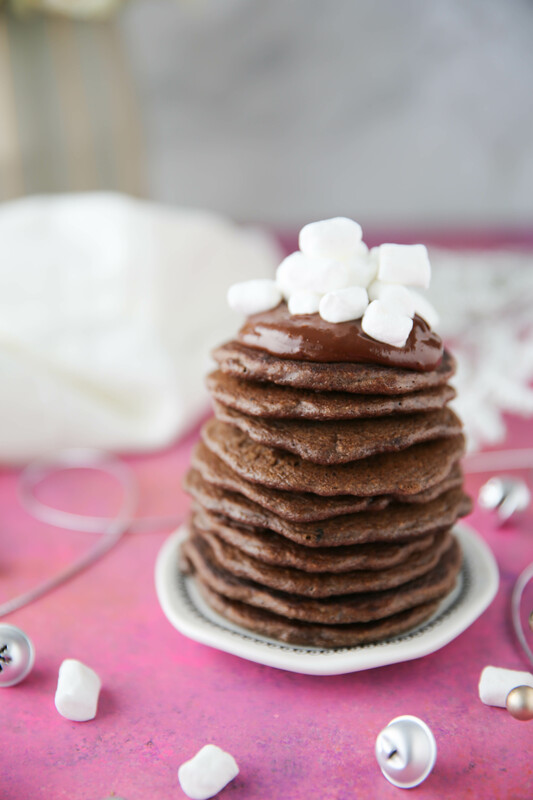 Pour melted chocolate on top of pancakes and top with mini marshmallows. 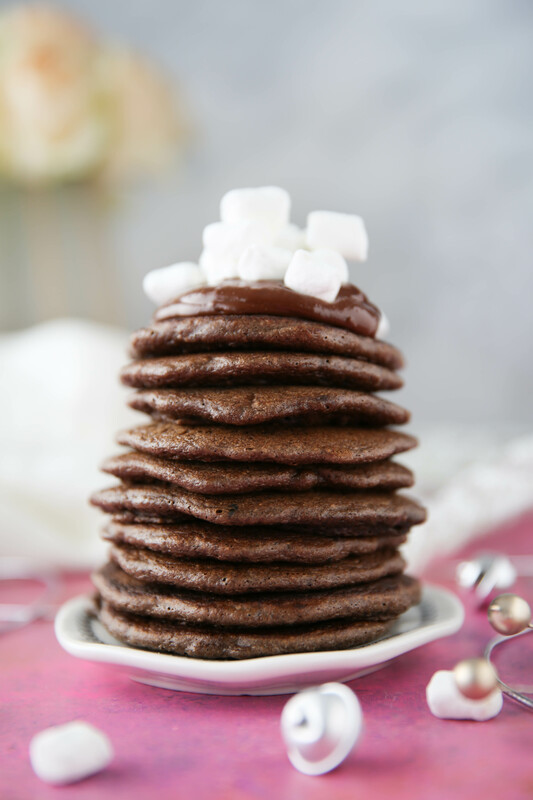 *If you don't have black cocoa powder, just use a little of the regular unsweetened cocoa powder. They just won't be quite as dark in color. Yum!! Pancakes sound so good right now. Especially hot chocolate ones! hope you love them if you try them out! Another great place in town for drinks/live music is Batey Mojito & Gaurapo Bar. So much fun! Have such a great time!!! perfect!! thanks so much for sharing all your favorites! Swing by Nomade and have a meal at Macondo… it’s boho decor and fresh, local food is divine. Seriously, the space and vibe are on point and the food is fresh, real and healthy. Tulum is pretty bougie these days, which is great if that’s what you’re going for, but for a more authentic feel (and if you have time), I’d definitely take the trek to the Coba ruins….definitely worth the trip. As far as places to eat in Tulum, there are tons all throughout the hotel zone and they’re all very easily made healthy. The further south you go, the more expensive everything will get and Tulum is not cheap (re: bougie comment). You’ll definitely want to try The Real Coconut for breakfast. It is Daniella Hunter’s restaurant (The Real Coconut chips a la Whole Foods) and it is hands down my favorite eatery in Tulum. Basically everything is gluten free (or gluten free available), made with coconut oil and coconut creams, etc. Can’t beat it. For lunch, Casa Banana is good. La Zebra is also really good. Great healthy options at both. For dinner, you will not want to miss Arca or Hartwood (they’re actually right next to each other, but do both!). Most places don’t take reservations, but you’ll definitely need them for Hartwood. Both are absolutely delicious. Really, there are tons of great options to choose from. Tulum has kind of evolved into the “it” place in the last 5 years so it’s culinary options have changed drastically. It’ll be very easy to stay on track and if you need a real CrossFit (that isn’t the kitschy Tulum wood gym), CrossFit Playa Del Carmen is beyond welcoming and it’s not a far drive. Plus, there’s tons to do in Playa as well. Have a great trip! awesome!! thanks for taking the time to write down all these recommendations! i just added all of them to my phone! Tulum is such a magical place, you are going to love it! – Hartwood for the best meal of your life. They have one outlet there and it is for their blender at the bar. All the food is cooked over open fire and is to die for. Get there early to put your name down and then go to Casa Jaguar for a drink while you wait. – Gitano’s for awesome atmosphere / after dinner cocktails. – Posada Margherita for the some amazing Italian and really cool atmosphere. Does not feel like you are in Mexico! (Not sure about their GF options though). Make sure to visit a centoe too. They are these natural pools/caves you can go swimming in and is an amazing experience. Do not bring any flashy clothes or high heel/wedges. It is a super casual boho chic little beach town. Think long flowy dresses, flat sandals and minimal makeup. Not like a Mexico all inclusive that most people are used to! thank you for all the recommendations!! You’re killing me Juli, killing me!! But I still love you! I too am trying to be better with all the sweets this month but these will probably make an appearance for Christmas morning breakfast! hahahah i’m doing the same thing and just today i made a cookie skillet and chocolate fudge. the struggle is real. These look amazing! I’m going to try this paleo baking mix! 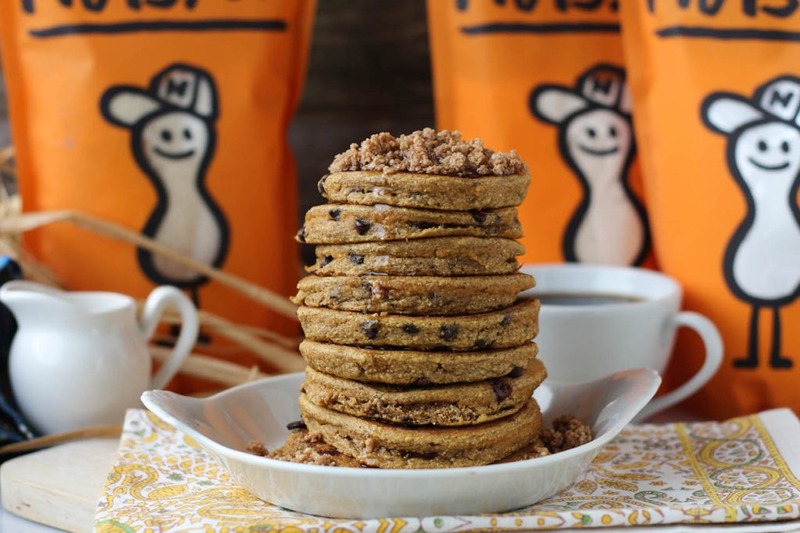 I bet my kids will love these pancakes! Have so much fun in Mexico! it’s awesome!! hope you love these pancakes! 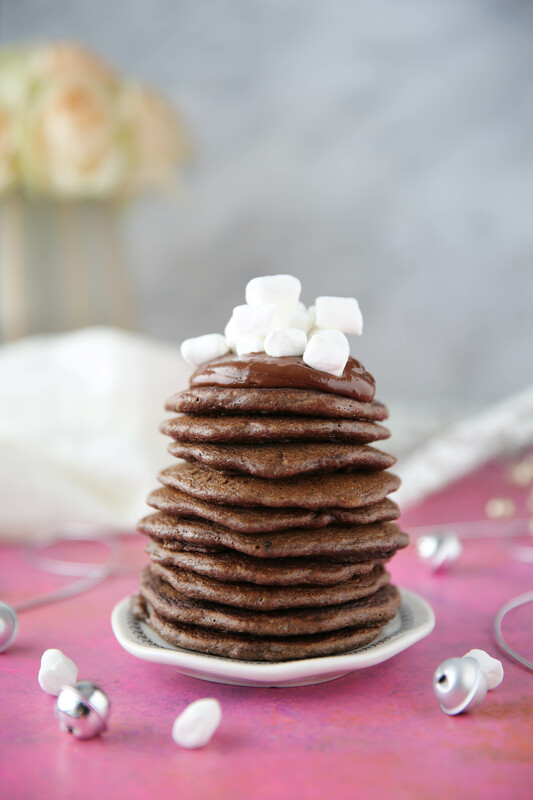 If we don’t have that particular Paleo baking mix, and we want to make these pancakes right now (because they look yummy! ), is there a substitute/equivalent for mixing the other flours myself? Umm yummy! Just made these for the kids and I’d say they were a hit! I didn’t have the baking mix but substituted almond flour and a TBS of Arrowroot flour for good measure! It made exactly 14! Sliced up some banana and drizzled the chocolate, sunbtter and some marshmallows. Thanks so much for these!! so glad you liked the pancakes Vicki!